Simply put, cellulite is fat pushing against the connective tissues of the skin. This creates the lumpy, dimpled look. fear. Cellulite is NOT a fat problem (though excess fat will only increase the appearance). Cellulite is a SKIN problem. Picture an over-stuffed mattress. The stuffing bulges out where it is not tethered down. That sums up the appearance of cellulite. The causes of cellulite are not well understood, but there are several theories. Unfortunately, none of these methods have been scientifically proven to work. Cellulite reduction techniques such as liposuction and dieting actually do not remove cellulite. However, eating a healthful, balanced diet and exercising may be the best way to reduce the fat content in cells and reduce the appearance of cellulite. There is currently no medical research to support the effectiveness of anti-cellulite creams in getting rid of cellulite. There is no scientific proof that anti-cellulite creams work, and there is no concrete way to measure cellulite, either. 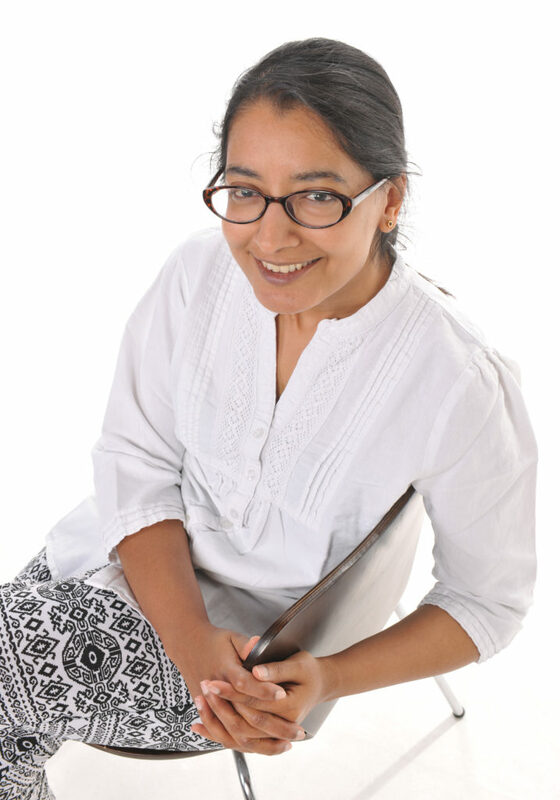 She tells her patients that cellulite is normal, and is likely the product of genetics and hormones. Eating healthy, low fat foods such as fruits, vegetables, and fiber can help one to avoid cellulite. Similarly exercising regularly, maintaining a healthy weight, and reducing stress are recommended to prevent cellulite. cellulite is NOT merely fat, although fat is required in order to form it. diet and exercise are not the only ways to address it. women are more likely to get it than men. Recent studies conclude that cellulite is more than just ordinary fat. 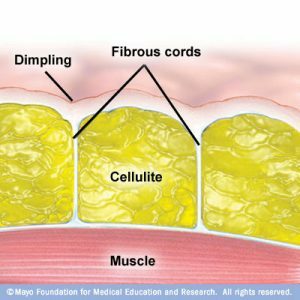 To treat it successfully, we have to understand the structure of fat, where it is distributed in the body, what causes it to form cellulite, and what then sets cellulite apart from fat. this fat layer is a source of energy. Fats are also called lipids, for the purpose of scientific discussion. When we store fats (lipids) for energy, they are accumulated in the fat cells (or adipocytes). Inside the fat cells, they are stored as “fatty acids”, combined with glycerol to form a molecule of triglyceride. When energy is required, the triglyceride molecules are broken down into glycerol and fatty acids that are metabolized as an energy source. The adipocyte is actually our storage cell. A collection of fat cells or adipocytes storing fat forms adipose tissue. What we commonly think of as “fat” is a form of loose connective tissue that is found beneath the skin, around muscles and organs. Dr. Nurnberger and Dr. Muller studied skin and subcutaneous fat in order to understand cellulite better, in the 1970’s. In the female body, they found that, the uppermost layer of the subcutaneous tissue (or hypodermis) consisted of freestanding fat cell chambers (filled with fat cells), separated by vertical walls of connective tissue called septa. The top (apex) of these upright fat chambers was in the form of an arc-like dome, which was weak and prone to collapse when undue pressure was applied. This pressure could be the result of excess weight, fluid retention or lack of strength due to little or no exercise. These larger chambers generated smaller compartments of fat cells (known as papillae adipose) that clustered tightly under the skin. This combination of freestanding fat cell chambers and compartmentalized clusters of fat cells are the elements that create the change in appearance in the skin’s surface that we call cellulite. more strength to the septa and enables them to withstand collapsing under pressure. They also noted that the smaller compartments of fat cells (papillae adipose) had the same structure in men and women. Thus, Drs. Nurnberger and Muller hypothesized that this difference in structure of fat cell chambers may predispose women to cellulite more so than men. Interestingly, men with more feminine characteristics tend to have fat cell chambers similar to women, thus inferring that hormones may control this aspect. Four progressive stages that occur during cellulite formation. In stage one, several changes occur in the dermis, not visible on the outside, resulting in a deterioration of the skin’s dermis. Thus, the integrity of the blood vessels and capillaries forming the transport network all around the skin slowly weakens. Similarly, the upper region of the dermis begins to lose some of its capillary network. Fat cells, housed within the freestanding fat cell chambers, begin to engorge with lipids, often swelling 2-3 times their original size. Fat cell clumping may commence at this stage as well. Fluid begins to accumulate in the tissue, most likely due to a breakdown in the capillary system. In stage two, dermal deterioration continues and the microcirculatory system continues to decline. Fat cells engorge further and clumping is more pronounced, pushing the much-needed blood vessels further away. It is not uncommon for gaps to appear in the dermis, which may be the result of the normal inflammatory process, which activates specific enzymes such as collagenase and elastase, creating an available path for immune cells to migrate to the site of inflammation.3 Fluids continue to accumulate. At this stage, “orange peel” skin is now evident. In stages three and four, the microcirculatory system continues to deteriorate, slowing metabolism in the cells of the dermis. Both protein synthesis and the repair process are reduced drastically, which may contribute to a thinning of the dermal layer. Protein deposits begin to form around fat cell clusters. Pinching the skin between finger and thumb at this stage demonstrates a definite “orange peel” effect. By stage four, hard nodules are evident in the dermal region. These are comprised of fat cell clumps encased in a hardened protein shell. This is the final stage in cellulite formation. Cellulite is most likely due to a combination of factors. We now understand the structure of the hypodermis and the differences in women. We now know from numerous studies that each of the four stages in cellulite formation is distinguished by changes in the molecular and structural level. Now we must examine what is the trigger mechanism and what is orchestrating this condition known as cellulite. According to Drs. Sherwitz and Braun Falco, one of the causes of the rippling effect of cellulite is fluid retention in adipose tissue.3 They noted that, along with an engorgement of fat cells, cellulite tissue showed clear evidence of fluid invasion in the connective tissue fibers of the upper layers of skin. They concluded that not only do the retained fluids cause visible swelling of thighs, hips and abdomen, but that the toxic wastes the fluids contain break down collagen and elastin fibers that help to keep the skin smooth and firm. Further studies by Drs. Nurnberger and Muller confirm this finding and indicate that there is a definite decrease in the number of elastin and collagen fibers in cellulite tissue. It is believed that, as we age, these structural proteins generally begin to stiffen and lose their flexibility. Engorging fat cells, accumulated fluids and toxins and poor circulation can exacerbate the loss of firmness. All of these factors are believed to contribute to the formation of cellulite. arteries or nutrient deficiency – can have a serious impact and accelerate cellulite formation. That is why cellulite generally appears in areas that have poor circulation; unfortunately, once it forms it slows circulation in an area even more. requires proper training and certification before it can be effectively performed.